This topic contains 13 replies, has 2 voices, and was last updated by Paul 1 year, 11 months ago. is there a way to make the picture of the top / newest post smaller on the homepage of the theme? Or are you looking to achieve something like that (see screenshot)? yes, exactly! That second picture is exactly what we are looking for. Is there anyway to achieve that? I tried resizing the picture itself, but it didn’t change anything. Yepp, I’ll provide you with the way to do that tomorrow — when I’m back in the office. If you want to keep the aspect ratio that the theme uses, and would just want to make the picture smaller (as in the screenshot I’ve posted above). Feel free to change 68% to whatever you feel looks best. If you want to still have the image fullwidth, with its height reduced. In this case you will need to alter the thumb size and then regenerate the thumbs. Here is how to do that. Please note that it’s best to do this in a child theme — so that your changes don’t get overwritten when you update the theme. 860 is the height. As all the other thumbnails in the theme, it’s slightly bigger than the area where it’s displayed (for sharper looks on Retina-like displays). Change 860 to whatever you like and save the file. Once you’re done, install and activate this plugin. Then go to ‘Tools’ > ‘Regen. Thumbnails’ and regenerate the thumbnails. Please mind that this will make you cover images smaller both on archive pages and on single pages. awesome! Thank you so much. Is there also a way to make the header image within the post smaller? So both the one on the homepage as well as the one on the post are the same size? Also, sometimes the image galleries are a bit glitchy. For example, one pic drops down to the bottom. On mobile, sometimes the posts are overlapping. So instead of showing the picture1, text1, picture2, text2. It shows: Picture1, picture2, text 2. Any idea why that is? P.S. I have some screenshots, if that helps. If you use the second way described above, it will get smaller both on archive and single pages. As for the galleries, can you please post screenshots of the behavior you are describing? 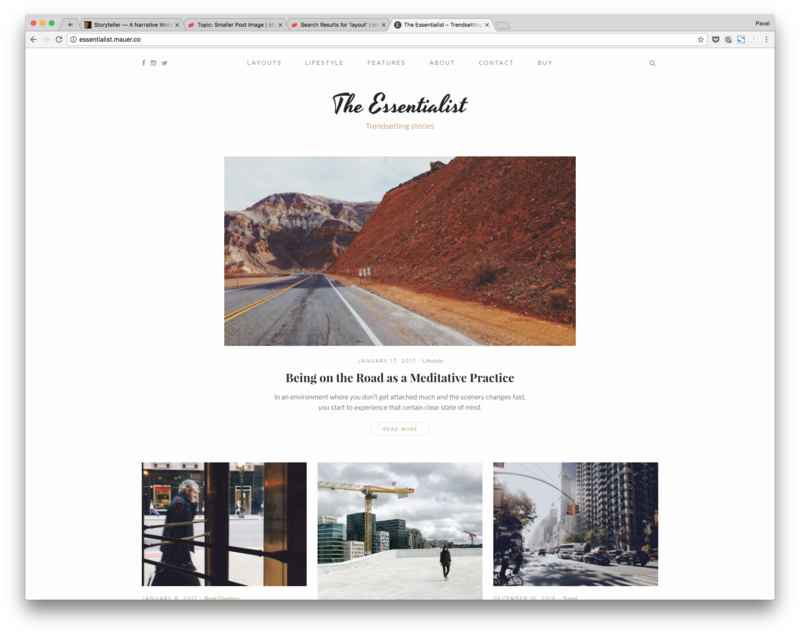 Do you experience the same issues with the galleries in theme demo (http://essentialist.mauer.co/)? I have a screenshot to show how the gallery is behaving. I wonder if it may have to do with image size? What is the best image size to upload to the gallery? I am not experiencing any issues with the galleries in the theme demo. I also have a screenshot to show the glitch on mobile, but I am not sure how to attach them to this blog post? Unfortunately, the new code you provided doesn’t work. It does keep the main image on the blog’s landing page small, but the header image on the posts themselves remain very large. I also have another question: Is there a way to make one of the links open up in a separate tab? Our link “Shop Apt2B” takes you back to our regular homepage, but we were wondering if we could have that open up in a separate tab? If you had the thumbnails generated by another theme, please regenerate the thumbnails. For that install and activate this plugin. Then go to ‘Tools’ > ‘Regen. Thumbnails’ and regenerate the thumbnails. As for the new code. 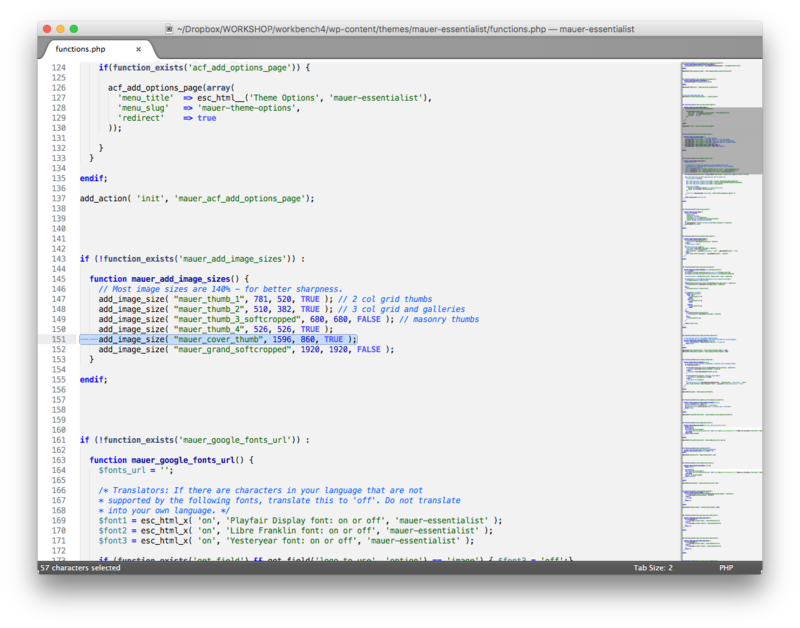 If I use this very code in Simple Custom CSS plugin, I get the cover image on single post pages small. See screenshots. So please double-check and make sure you are using this code, and that no part of it is lost. The menu item can lead to a new tab. This is a built-in WP feature. You just need to make it visible in Screen Options. Here is a very quick demonstration. If you enjoy the theme (or the support), please rate it on ThemeForest. This takes a moment and really helps a lot. Thank you. thank you for the great support. I rated the theme 5 stars not just for the great design, but also for the great support. You can probably imagine we are very happy with that. Thanks for your kind words and for the review. I really appreciate that. About the galleries, you need to use images that are bigger than 526×526 for the galleries to work properly. Here is the full version of a pic from a gallery — it’s just 600×428, it’s height is too small. 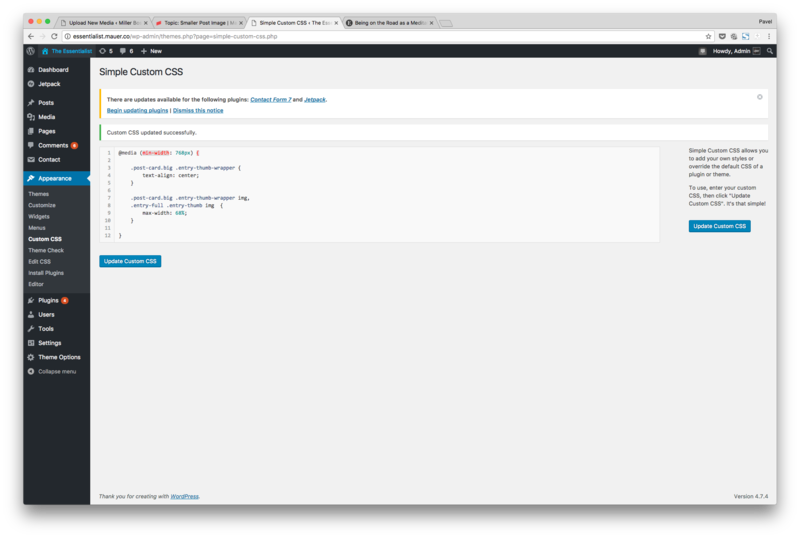 What you might not know is that you actually don’t need to resize anything manually before uploading — WordPress automatically generates all the sizes of an image used in the currently active theme once you upload the image. 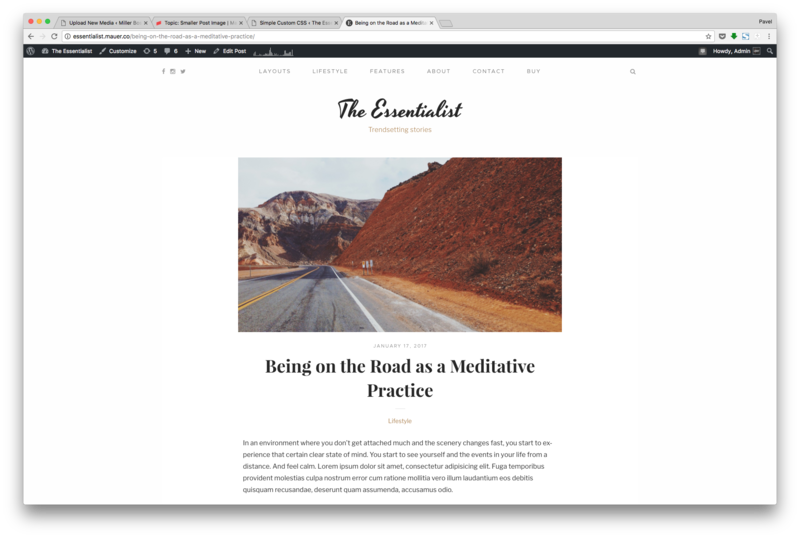 So there’s no need to manually resize images before uploading them to your site running the Essentialist. Just upload the biggest pictures you have (let’s say 1920×1440), and WordPress will do the rest for you — creating copies of the image in all the needed sizes including the one for the big first image. Also, the Photon module (part of Jetpack plugin) that you use to serve pictures caches images forever (source). So you need to re-upload bigger versions of your pictures with different names if you want to serve them with Jetpack. The topic ‘Smaller Post Image’ is closed to new replies.